Last Tuesday (10th December) was International Human Rights Day. 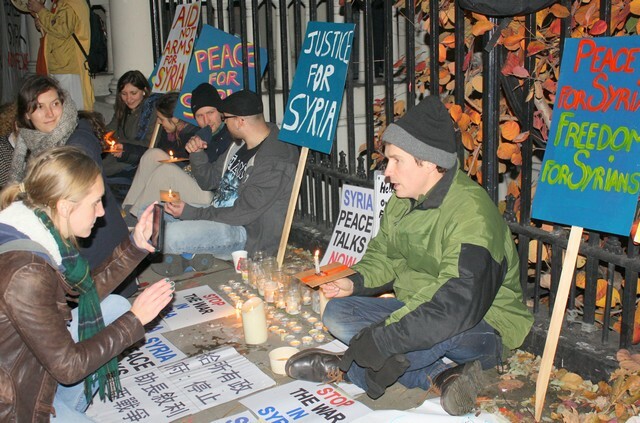 Syria Peace and Justice, a grassroots London-based group that was formed only two months previously, had decided to mark the day with a ‘Peace Pilgrimage’ for the people of Syria. We also wanted to express solidarity with Syrian activists working non-violently for peace, freedom, human rights and social justice in Syria. 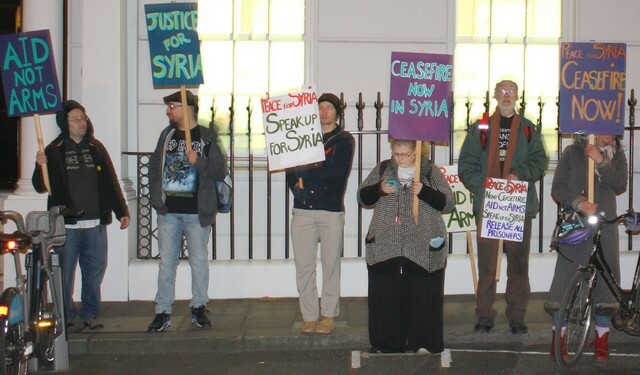 There were to be two feeder groups, each of which would visit different embassies and offices in central London with a significant connection to the Syrian crisis to deliver a letter from the group containing a list of eight requests. The plan was for the two groups to converge at the US embassy. 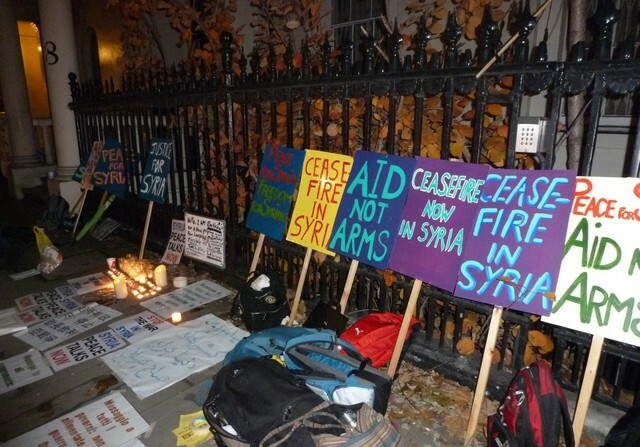 The group would then visit a few more embassies together en route to the Syrian embassy in Belgravia, where a candlelit vigil would be held. Our group of eight peace pilgrims assembled outside the headquarters of the UK section of the United Nations High Commission for Refugees on the Strand at noon, where a letter addressed to the agency’s UK representative was delivered to the reception. 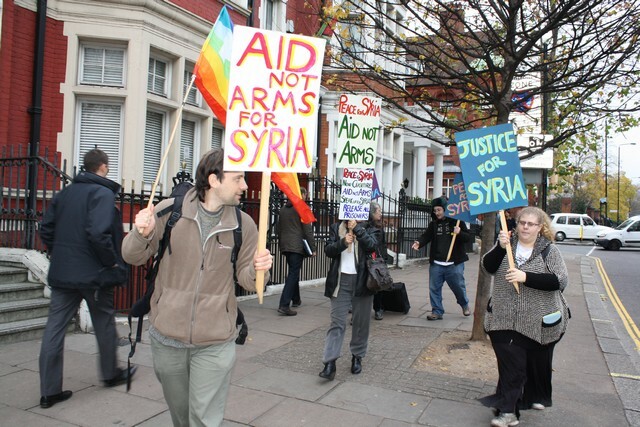 We then walked down the Strand, past Trafalgar Square and down Whitehall, as far as Downing Street, where a member of the group delivered a petition to the office of the Prime Minister calling for an end to the fuelling of the Syrian conflict. Afterwards, we called in at the nearby Foreign and Commonwealth Office. We continued our pilgrimage through the busy streets of London, filled with seasonal shoppers, headed for the Chinese embassy in Portland Place. Upon arrival, we encountered a Chinese Falun Gong practitioner who was maintaining a peaceful presence across the road from the embassy. Falun Gong (or Falun Dafa) is a popular spiritual movement in China, based on meditative practice. It is banned in the country and its adherents are brutally persecuted. 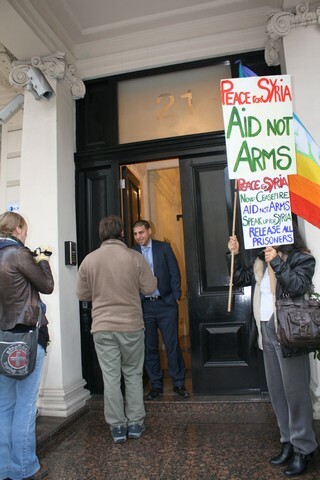 The man confirmed to us that our placard in Chinese read: ”Message to All Governments: Stop Fuelling the Syrian Conflict.” We handed our letter to a member of staff at the embassy, and continued on our way. Along the way, we stopped to talk to members of the public who took an interest in our pilgrimage: these included a number of Syrians. 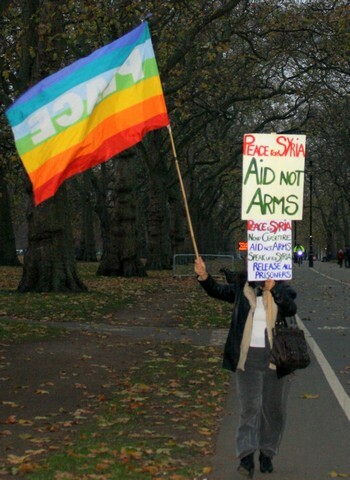 We continued as far as the US embassy in Grosvenor Square, Mayfair, where we were soon joined by our peace brothers and sisters from the other group. Our truly global assemblage of concerned citizens assembled outside High Street Kensington underground station at noon. Our small but perfectly formed peace delegation consisted of women from Canada, Colombia, Montenegro and the USA, a couple of Englishmen, and one woman who had travelled all the way over from Ireland for our peace mission. Once all the placards and other paraphernalia had been distributed, we marched down the road, headed for the Israeli embassy. Approaching the gates leading to Kensington Palace Gardens, a privately-owned road upon which the Israeli and various other embassies are situated, we were stopped by a guard, who would not permit us to pass in order to deliver our peace message. Further negotiations ensued with a policeman brandishing a semi-automatic rifle. He explained that it would neither be possible for us to deliver the letter by hand, nor for a member of staff from the embassy to come out and receive it, nor for him to accept it on the embassy’s behalf. He informed us that we would need to send it in the post. few photos, the solitary armed constable on duty insisted that we move to the other side of the road. 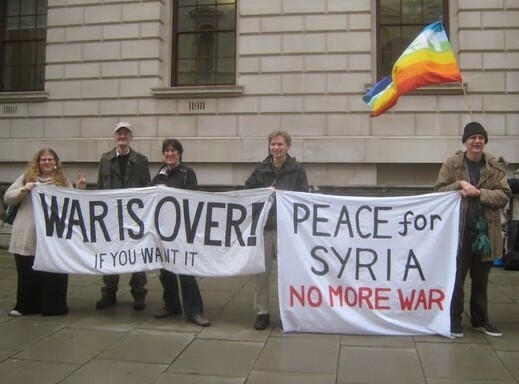 We followed his instructions and got out our big “Peace for Syria – No More War” banner. Two members of the group read out our list of requests and the names of political prisoners in Syria. We then doubled back down a busy Kensington Church Street, where we were highly visible to pedestrians and traffic alike. There were quite a few toots of support and thumbs up along the way, as there were throughout the day. We carried on past Kensington Gardens and down to what we thought was the Iraqi embassy. It in fact turned out to be the consulate, but the receptionist on the intercom helpfully directed us towards the nearby embassy. Upon arrival, a member of staff politely received our letter. I found it somewhat surprising to observe a complete lack of a security presence outside the building, in stark contrast to the Israeli and Russian embassies, and the American and Saudi ones that we would visit later. 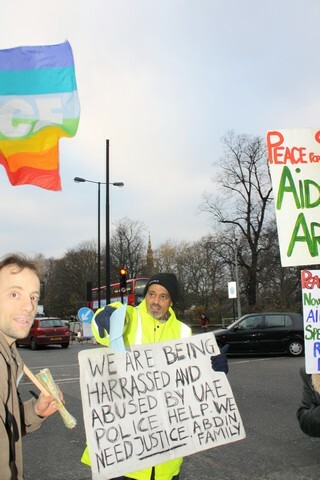 We continued to Prince’s Gate, near the Royal Albert Hall, where we had an encounter with a Middle Eastern man standing on the corner facing the traffic, who was holding up a placard that accused the United Arab Emirates authorities of persecuting his family. We chatted with him for a while, and he told us that he had been protesting there and at other locations in central London for several months. We wished him well, took the details of his Facebook page, and explained to him a little about our peace pilgrimage. We then proceeded to what was supposed to be the Iranian embassy. It seems, however, that the Iranian diplomatic mission has been ejected and replaced by the ‘Iran interests section’ of the Omani embassy. After standing outside the entrance for a short while, we were joined by a freelance photographer who had just caught up with us after following the Westminster group around. Before any of us had even approached the front door, a somewhat perturbed-sounding voice rang out of the intercom, telling us that we couldn’t protest there, and that we had to go onto the main street. I calmly explained that it was quite all right, we just wanted to deliver our letter, and we would then leave them in peace. 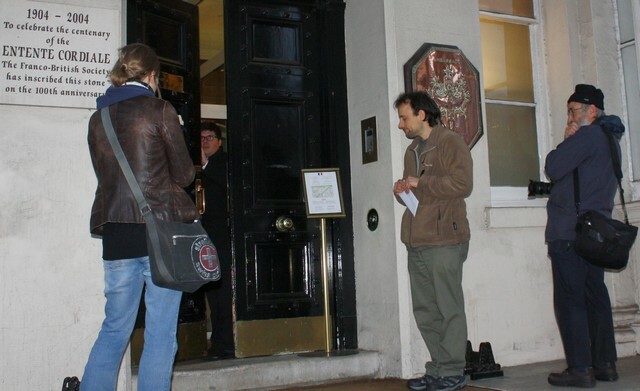 He said that someone would come down for it, but after waiting about ten minutes and ringing the intercom bell a couple of times, there was no sign of anyone appearing, so I slipped the letter under the door and we marched on. The next ports of call were the Kuwaiti and French embassies, located opposite each other on Albert Gate, just off Knightsbridge. The former opened the door to us and took our letter, although the receptionist wasn’t too happy about people filming and taking photos. I then tried the bell of the French embassy just opposite, and after offering them a friendly ‘Bonjour’ and an explanation of our visit, the receptionist told us to wait a moment. 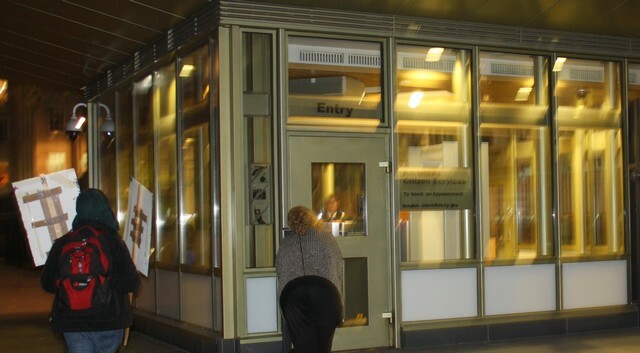 She eventually came back to the intercom and explained that for security reasons, she couldn’t open the door to us, and instructed us to slip the letter under the door, which I duly did and we continued on our way. We cut through Hyde Park, where he had to bid farewell to our friend from Ireland, who had another engagement to attend. We finally arrived at the US embassy shortly after 4pm, where we joined the rest of our peace brothers and sisters, albeit half an hour or so later than planned. 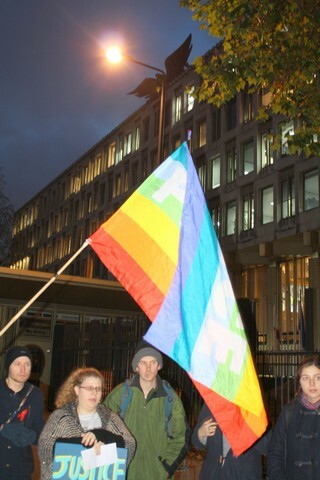 By the time everyone had assembled at the US embassy, it was beginning to get dark. We eventually all formed a circle so that we could check in with one another. It was decided that a small delegation would head straight to Belgrave Square, where they would seek to honour an appointment with a representative of the Turkish embassy, while the two German nationals in the group would call in at their embassy, also located in Belgrave Square. While still at the US embassy, there was a reading of the group statement. This was followed by an attempt by a peace sister from the US and others to deliver the letter. However, the security checkpoint outside the embassy insisted that for security reasons, it would need to be sent in the post. 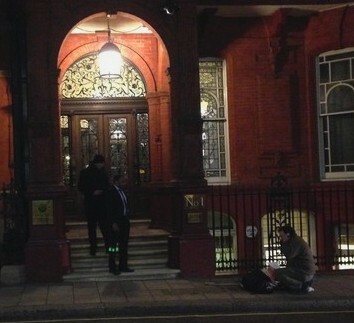 The meeting at the Turkish embassy didn’t happen in the end, as the individual who was to receive our delegation had already left.However, an Anglo-Syrian member of our group did manage to hand in the letter, and it was agreed that the meeting would be re-arranged for a future date. Meanwhile, the rest of the group had continued on from the US embassy towards its Qatari counterpart, where a staff member came out to politely receive our letter. Some of us then became engaged in an animated discussion with a Syrian man who had been passing by. He was strongly against the Assad government and seemed to support foreign military intervention in order to overthrow him. We tried to reassure him that we shared his concerns about the humanitarian and human rights situation in the country, but explained that we didn’t think that further militarisation of the conflict was a solution. I handed the man one of our flyers and we invited him to keep in touch with us, before continuing on our way. The next stop was the Saudi embassy. We inadvertently walked straight past the building the first time, as there was no flag or flagpole outside. We finally located it, but it was closed by the time we arrived. No sooner did we approach the door than a pair of policemen armed with rifles approached and informed us that embassy security had alerted them to our presence. We explained the peaceful purpose of our visit and, after showing one of the constables the letter and envelope to reassure him that it did not present a security risk, I slipped it under the door. We bade the officers farewell and continued on our journey towards Belgrave Square. 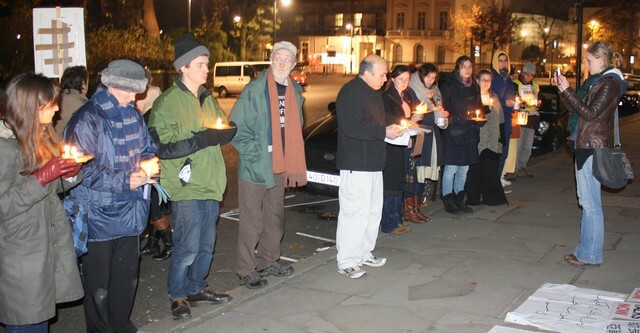 Soon after 6pm, everybody was assembled outside the Syrian embassy and we were able to begin our candlelit vigil. There were two dozen vigilers present by this time, and a couple of freelance photographers.The atmosphere was calm and peaceful.We were joined by a Japanese Buddhist monk who lives in a small temple close to the Peace Pagoda in Battersea Park. He gently chanted and beat his hand drum, which helped to draw our attention inwards. In addition to the nationalities mentioned previously, by this time there were individuals present from Kurdistan (Iranian part) and Sweden. 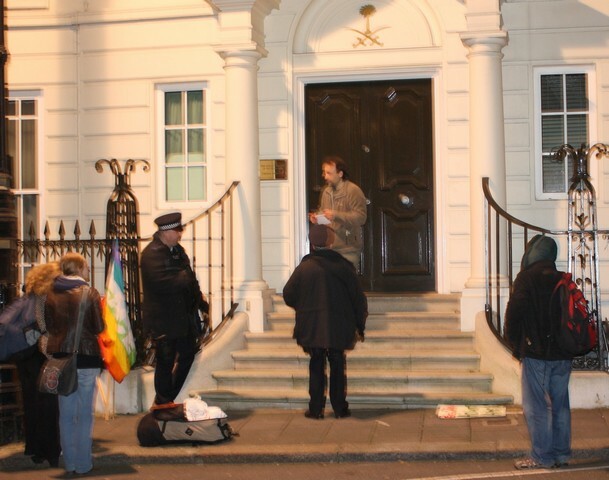 After spending a while chatting, sharing food and drink, posing with signs in different languages, and setting up candles, banners, etc, we all stood in a line facing the now empty embassy, its entrance guarded by a solitary policeman. 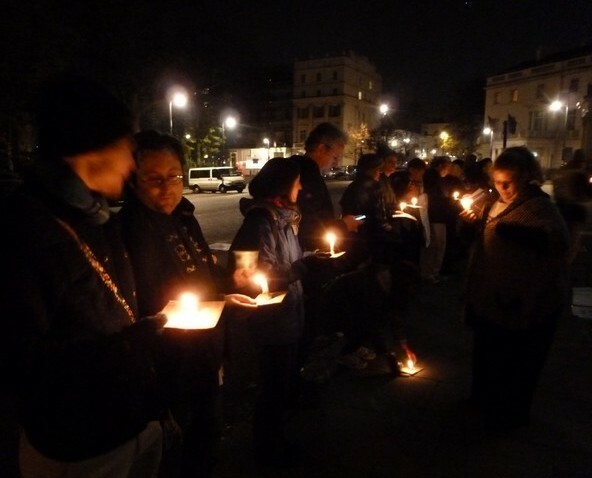 We each held a candle in our hands and together shared a few moments of silent reflection. A Syrian-American woman then read out the group’s list of requests to the Syrian and world governments, after which an Anglo-Syrian man called out the names of individuals who have been incarcerated since the beginning of the 1000-day-old Syrian uprising. The vigil was concluded with a second period of silent reflection. Having maintained our peaceful presence outside the embassy for a couple of hours, we packed everything away, bid one another farewell, and the tired peace pilgrims dispersed into the night. Thank you very much to all who supported Tuesday’s activities for peace and justice for the people of Syria in central London, on International Human Rights Day. 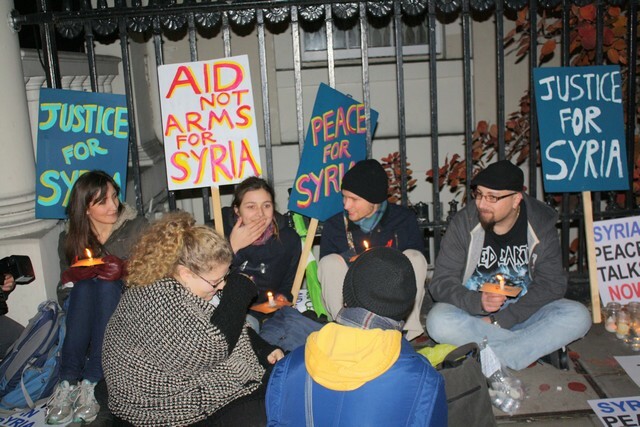 At least thirty people took part in the day’s activities in total, including at least 25 that joined the candlelit vigil outside the Syrian embassy. Our international group of peace pilgrims included several Syrians, as well as individuals from Canada, Colombia, Germany, Ireland, Japan, Kurdistan (Iranian part), Montenegro, Sweden, UK and USA. Below you can find the text of the letter that we will attempt to deliver by hand to various world embassies during today’s London Peace Pilgrimage for Syria. We will attempt to deliver it to the following embassies: China, France, Germany, Iran, Iraq, Israel, Kuwait, Qatar, Russia, Saudi Arabia, Syria, Turkey and the United States of America. We also plan to hand in a copy (f0r their information) to the London office of the UN High Commission for Refugees, accompanied by a short covering note. In addition, we will attempt to deliver an almost identical version to 10 Downing Street and/or the Foreign and Commonwealth Office. We hope that a delegation of our group will have the opportunity to speak with at least some of the ambassadors and officials, or their representatives. All are welcome to join us! See earlier posts for more details. We are a group of global citizens visiting your country’s embassy today because we are deeply concerned about the plight of the people of Syria. We would be most grateful if you could inform us in writing, at your earliest convenience, of the steps you are presently taking, and intend to take in the near future, in respect of the above issues. Meet-up details for Peace Pilgrimage for Syria. Please find below some practical details for the Peace Pilgrimage for Syria, taking place in central London on Tuesday 10th December – International Human Rights Day. There will be two groups starting from different locations, so that all the key embassies and offices can be comfortably covered on foot. You are welcome to join either group. – Group B will meet outside the office of the UNHCR* (UN Refugee Agency) at 12noon, calling in at Downing Street / the Foreign Office and the Chinese embassy. The total distance covered by each group will be around 5 miles. Please bring food and drink to share during the day (hot tea or coffee in a Thermos flask would be great), as well as warm clothing and wet weather gear, if needed. If you have any rainbow peace flags or similar, feel free to bring those as well. The Syria Peace & Justice group is currently in the process of planning a series of actions in London for International Human Rights Day, on Tuesday 10th December. 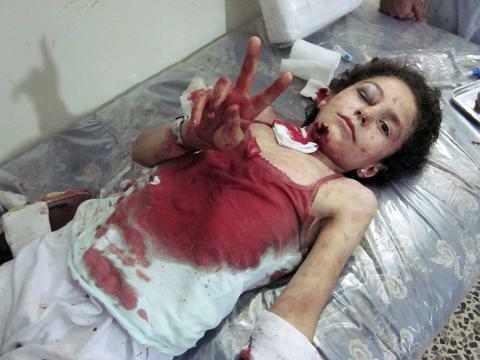 We will be calling for an immediate ceasefire and a Syrian-led peace process; applying pressure on all parties to address the desperate humanitarian situation and end the grave human rights abuses without the use of further violence; expressing solidarity with Syrian activists non-violently working for peace, freedom, human rights and social justice; and calling on all foreign actors to stop fuelling the conflict through arms supplies and other forms of military interference. 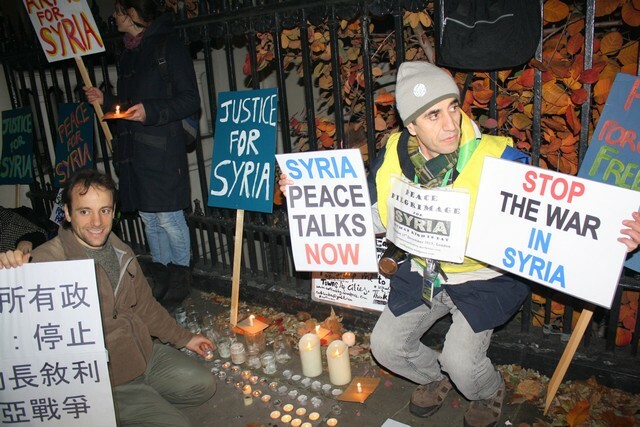 The ‘Peace Pilgrimage’*, beginning in central London at 12noon, will consist of visits to the embassies of key players in the Syrian crisis, both those supporting and opposing President Assad and his government, as well as the UN High Commission for Refugees and Downing Street / the Foreign Office, ending with a candlelit vigil outside the Syrian embassy in Belgrave Square, from 6pm. So please keep the date free in your diaries, start spreading the word, and watch this space for more details! 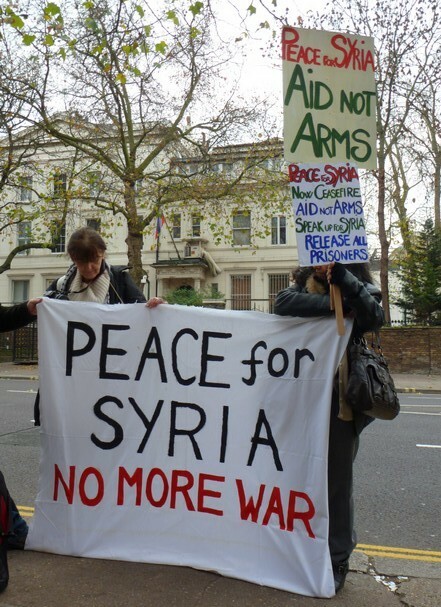 The next general meeting of the Syria Peace & Justice group will take place at the London Action Resource Centre, 62 Fieldgate Street, Whitechapel on Wednesday 11th December, from 7pm to 9.30pm. Feel free to join us! 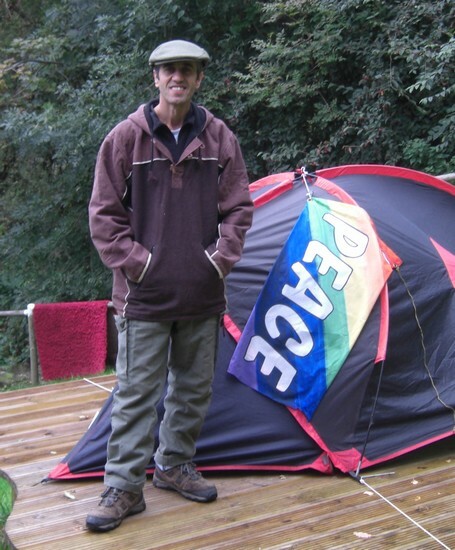 * This action will be carried out in conjunction with a month-long ‘London Peace Pilgrimage’ by fellow peace-worker ‘Earthian’, who has travelled extensively to and around the Middle East with no money or passport, in pursuit of peace. You can read his blog here.